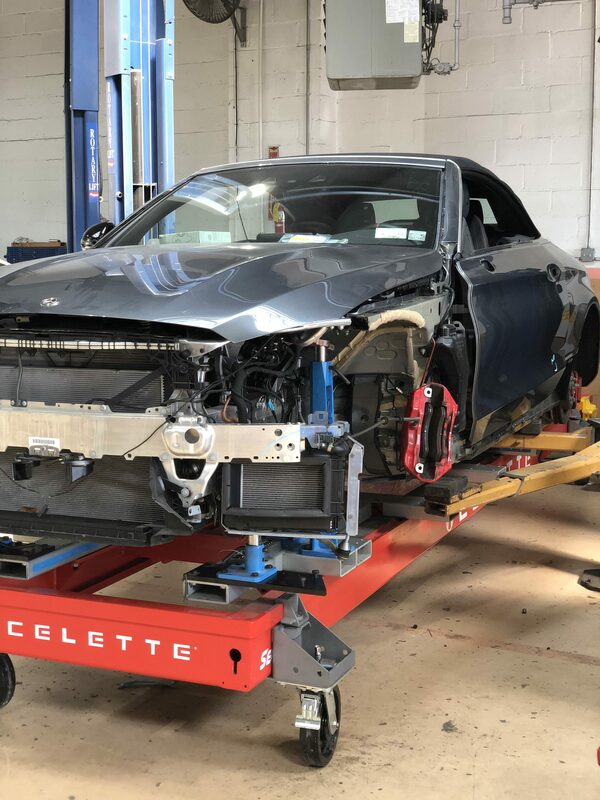 Mercedes Benz - Why only a dedicated fixture bench (Celette) is approved – Fiero Collision Inc. If you’re considering bringing your Mercedes Benz to an auto body shop without a dedicated fixture bench please read the bulletin below issued by Mercedes Benz. 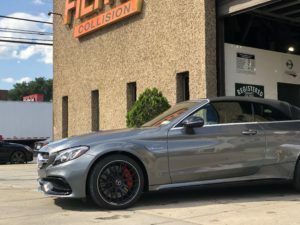 Most shops will have benches that use pinch weld anchoring and even the latest electronic measuring systems, but that equipment is not approved by Mercedes. In the United States, the only companies marketing straightening equipment approved by Mercedes-Benz USA, LLC are Celette and Car Bench. 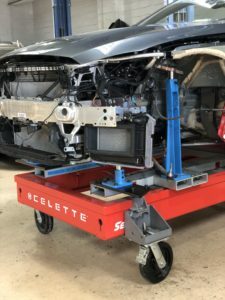 Both Celette and Car Bench work closely with Daimler AG (Stuttgart) in designing and building dedicated fixture sets for Mercedes-Benz and Maybach vehicles which not only provide for accurate component location, but also provide a safe, proper anchoring of the vehicle during pulling operations. Mercedes-Benz does not publish body dimension data nor do we approve performing comparative measurements to determine vehicle location or measuring points to perform body repairs. The fixed mounting points on the body along with the use of a dedicated fixture bench and straightening brackets provide for an exact and proper placement of the body. 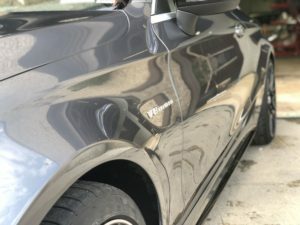 Daimler AG specifically states jacking points in the rocker panels are to be used only to lift a vehicle, and are not designed to be used as or appropriate for use to anchor the vehicle for structural repairs.The longitudinal pinch welds for the floor pan are not designed or intended to be used for anchoring the body. When using pinch welds to carry out straightening repairs, the vehicle can work loose and warp. Constant readjustment is necessary and damage to previously undamaged body panels is possible. 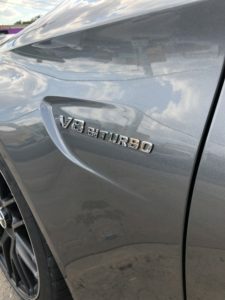 Therefore, these systems are not suitable for Mercedes-Benz vehicles and in this respect can only be regarded as supplemental equipment for use on competitor vehicles or for damage diagnosis. 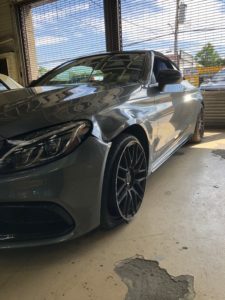 Mercedes-Benz collision repair procedures are very specific concerning the type of equipment used in the repair and reconditioning of bodies following an accident. Mercedes-Benz collision repair procedures require that vehicles requiring structural repairs or major tensioning forces (pulling) be repaired on a Mercedes-Benz “approved” dedicated straightening bench. “Structural” damage, for example, is any damage to axle mounting points or side/cross members. 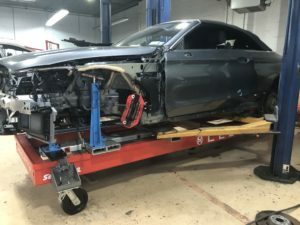 The vehicle must be mounted and securely fastened to the dedicated straightening bench at points not affected by the accident using the straightening brackets and the vehicle-defined mounting points. Mounting the body in this method allows for dimension variations in the deformed parts to be immediately recognizable. Mercedes-Benz does not publish body dimension data nor do we approve performing comparative measurements to determine vehicle location or measuring points to perform body repairs. The fixed mounting points on the body along with the use of a dedicated fixture bench and straightening brackets provide for an exact and proper placement of the body. This method is used to duplicate the precision necessary to ensure that the repaired body meets our specifications. When comparing the time required to set up the vehicle on a dedicated fixture bench and the entire straightening and repair procedure, the times may appear to be negative, however they are more than compensated for by the quicker straightening and welding work without the need for any body re-adjustment. When using a bench for straightening, the force is initiated at vehicle points specifically designed for this purpose. The straightening brackets absorb the pulling forces. The correct amount of pulling is achieved when the body measurement point locates itself with the matching straightening bracket without stress. New body parts can be “located” over the straightening bracket for accurate welding with no distortion. Measurement errors, such as can arise with measuring systems, cannot occur. In the United States, the only companies marketing straightening equipment approved by Mercedes-Benz USA, LLC are Celette and Car Bench. Both Celette and Car Bench work closely with Daimler AG (Stuttgart) in designing and building dedicated fixture sets for Mercedes-Benz and Maybach vehicles which not only provide for accurate component location, but also provide a safe, proper anchoring of the vehicle during pulling operations. When performing any repairs on Mercedes-Benz and Maybach vehicles, the correct procedures must be followed. The correct materials, tools and equipment must be used. In the event that jobs are performed as sublet repairs, the dealer is responsible for providing these materials, tools, equipment and procedures to those performing the repairs. Failure to do so may result in the decertification of the Certified Repair Facility. This bulletin has been created and maintained in accordance with MBUSA-SLP S423QH001, Document and Data Control, and MBUSA-SLP S424HH001, Control of Quality Records.